Mirror photo by Patt Keith Artist Sarah Wolf Newlands, shown in her art studio on Hollidaysburg, holds a piece of her artwork which incorporates recipes. Newlands, originally from Blair County, will have an exhibition of her works on display at Southern Alleghenies Museum of Art at Altoona. HOLLIDAYSBURG — The smells, textures and repurposed remnants of the Wolf family — a local, multi-generational, philanthropical and economical presence — are portrayed in sculpture, recipes and reminiscences of family and friends through an exhibition at the Southern Alleghenies Museum of Art-Altoona, opening Sept. 14. Artist Sarah Wolf New-lands is a fourth-generation descendant of Charles and Annie C. Wolf, founders of the Wolf Furniture Company and her multi-sensory exhibits honor her family’s history as parents, artists and art patrons. A Blair County native, Wolf Newlands, 54, lives in Portland, Ore., and returned to Hollidaysburg as an artist in residence in a studio/apartment along Allegheny Street. She received a sabbatical from her position as an assistant professor in the University Studies Department of Portland State University. 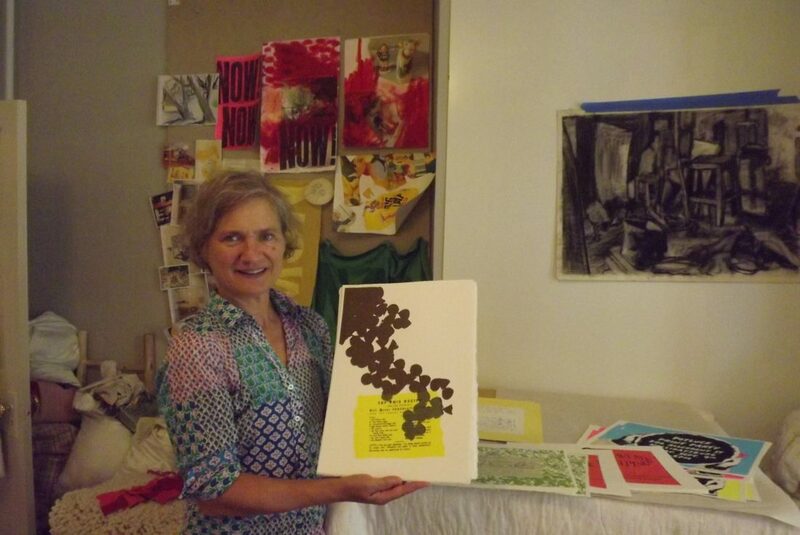 “I wanted to make the art here and retreat to Hollidaysburg to create here,” she explained. The two-part exhibition, entitled “Keeping House: Prints and Sculpture” focuses on her sculptural works and a community recipe screen-printing project. The works spring from Wolf Newlands love, grief and healing processes following the deaths of her parents. Her art represents home as material things and as an imaginary concept entangled in time and memory. Wolf Newlands is one of several artists in the family: A golfer’s portrait painted by her great-grandmother Annie C. is on permanent loan to the Blairmont Club from SAMA’s permanent collection. The artist’s great-aunt Margery Wolf-Kuhn played an integral role in the early years of SAMA and the Loretto Museum’s balcony gallery is named in her honor. Margery was the fourth of Charles and Annie C. Wolf’s five children and her siblings were George, John, Herbert and Dorothy. Wolf Newlands’ exhibit takes place in the George A. and Herbert T. Wolf Gallery — named for her grandfather and great-uncle — through Jan. 12, 2019. Her father, Herb Wolf II, died in 2002 and her mother, Nancy (Hobson) Wolf, 83, died on Christmas Eve of 2015, following a massive fatal stroke. The sculptures and recipe screen print art represent the fruits of her discoveries and musings about the meaning of home. “Now House,” an installation piece located in the lower Wolf Gallery, recreates her fond memories 0f the blanket forts she created in the back of the family station wagon or in the living room. “Now House” is made up of accumulations of fabrics embroidered by the artist with the words “Now” and “This,” as Wolf Newlands “reflects on time, the persistence of presentness and memory. The words refer to the present, while the materials refer to other times in this installation,” she said. Two photos brought back fond memories of family’s trips in a station wagon to see her maternal grandmother in Kentucky. Wolf Newlands previously served as an artist in residence through Portland’s GLEAN project, where she created art from materials salvaged at the city’s transfer station. The experience provided Wolf Newlands with a new perspective on society’s excessive cycle of consumption and waste. “Keeping House” is supported in part by Oregon Arts Commission, Portland State University, Ford Family Foundation and the Wolf-Kuhn Foundation with special thanks to Gallery 321, Jen Cherry, Terry (TJ) Geist, Barbara Hollander, Barb Leiden, Roxanne Montero, Jamie Powers, Steve Sloan and Neil Young. The exhibition will include artwork on loan from the collections of Jordan Schnitzer Family Foundation and Oregon Metro Regional Government. One sculptural works on view will be “Dress for Artemis,” a piece composed of a salvaged cotton dress, used socks, metal hanger and cotton thread to honor the ancient Ephesian cult statue of Artemis. The inspiration came from discovering her Aunt Marge’s unused checkbook ledger repurposed as a recipe diary. Her maternal grandmother’s handwriting stirred the artist’s soul. Wolf Newlands’ collection of about 50 recipes come from her own family, friends and community members willing to share tasty treats and associated memories. The visual elements of the screen print reflect the associated story and or memory. For her Aunt Marge’s handwritten apple butter recipe, Wolf Newlands created a vibrant green shrubbery border representing the boxwood shrubs at her home. SAMA Trustee Emerita Joan W. McCreary submitted her mother’s Prune Upsidedown Cake, according to a news release.